WRYOA has three principal strands of activity: WHIZ (Whalley Range Inclusion Zone) is our programme of work for young people aged 11 – 19 years (25yrs wider remit), currently providing a wide range of activities four evenings each week as well as on-going support for young people; JNR8, which is the name by which our base is generally known, but is also our programme of holiday provision for children aged 12 and under; and Celebrate, our annual community festival uniting all sections of the community in a day of fun and creativity. All the projects are focused on working directly with young people and the wider community. WRYOA is innovative in that it is run and managed by local people for local people. We encourage young people to become volunteers and then workers within the projects. It was set up in 1982 by a group of local residents and community members forming a charity dedicated to widening the educational, cultural, and social opportunities for local children and young people. After over 30 years work we have seen profound and welcome change in our community. Whiz Youth Project exists to help and educate young people through their leisure time activities so to develop their physical, mental and social capacities, that they may grow to full maturity as individuals and members of society and that their conditions of life may be improved. We take a holistic approach to promoting health and wellbeing, one that takes account of the stage of growth, development and maturity of each individual, and the social and community context. 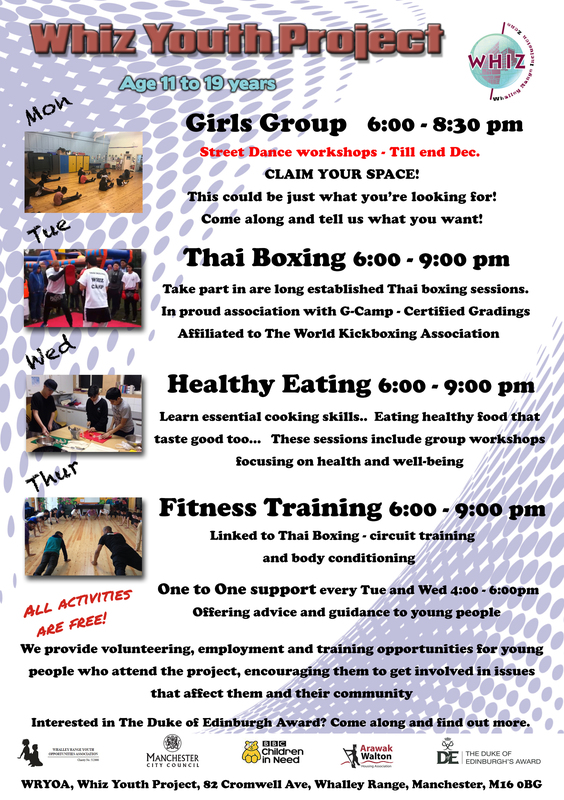 All provision and trips are low cost or free, including our Thai Boxing sessions. Whalley Range Youth Opportunities Association (WRYOA) was registered as a charity in 1982, making it 31 years old this year. Our voluntary group started in October 1981 as a result of the disturbances by local young people who had left many shops in Moss Side and Whalley Range damaged. Local traders on Withington Road were approached by workers and volunteers from the Free Range Project (FRP) that was based on Withington Road (103) and worked with local young people. The traders agreed to start an association through which they would make regular contributions for activities for young people in the area. The original committee was made up of local traders (the milk man, the treasurer, the owner of the Simpson Hotel, the chair and nine traders were regularly involved in meetings and making donations) and many local young people who were involved with the FRP. The funding from the traders paid for a football strip and activities such as coach trips and other outings. Some of the traders became active volunteers such as the publican at the Caught on the Hop (now the site of the doctors’ surgery). The young people knew that a working relationship was being built with the local traders and that we were encouraging discussion rather than recriminations and aggression on both sides. In 1982 the Association became a registered charity. For several years WRYOA became dormant as the members moved out of the area, and some of the work was taken on by the Free Range Project. However, after the closing of the FRP the WRYOA was revitalised and a group of local volunteers including one member of the original volunteers (Carol Packham) and members of the Free Range Housing co-operative (where the registered office was based) started organising local activities again. This included the running of a weekly group for under 13’s initially held at Manley Park Junior School and then at the Manley Park Methodist Church (the group was linked to Woodcraft folk). The first major activity was the Celebrate Festival in 1998, which is a huge success in itself, and had its 15th year this year. Successful partnerships with the City Council resulted in us obtaining funding to establish daytime provision for young people not attending school, the Whiz (Whalley Range Inclusion Zone) Project, closely followed by funding to run a detached project, Whiz-out. The WRYOA management committee decided not to continue with its involvement with the then Manchester Youth College, Pupil Referral Unit and in Summer 2005 the daytime provision closed. Following the termination of the funding for the outreach project the Whiz-out project was also suspended although the workers have continued outreach and community link work. So, WRYOA has been running in Whalley Range now for 30 years, and has built a great reputation, through our play scheme JNR8 and youth provision Whiz, working with young people ranging from ages 5-25 years, whose parents attended the project before them, and some of whom are working with us now. We have over 130 young people from a diverse range of backgrounds on our register. We provide opportunities for them to participate in various activities, including cooking, Thai boxing, football, group discussions and workshops around issues that affect young people and their community, such as unemployment, stereotyping, crime, gang awareness, drugs etc. We are also committed to supporting young people and community members through offering a variety of volunteering opportunities, from working directly at our project to involvement in the planning and setting up of our yearly community festival, Celebrate.